I have collected and edited a large amount of research data since I first began my magical adventure with the Kombucha Mushroom Tea. I first fermented Kombucha in the early 1990's when I discovered the tea through my friends and colleagues in our study of Traditional Chinese Medicine in Santa Cruz, California. I am updating this information as best as I can and will be included in our Free Online research library. I welcome all to share and contribute. Kombucha Mushroom Tea is a World Famous Health Elixir. Very easy, simple and safe to make right at home. A simple combination of sugar, tea and the kombucha symbiosis. Visit our Complete Brewing Guide to see how easy it can be. Kombucha is very safe and surprisingly healthy. The American FDA and CDC has investigated all reports of health concerns and has found kombucha tea to be safe. Kombucha = S.C.O.B.Y. Serendipitous Colony of Bacteria & Yeasts. The kombucha SCOBY is a living complex. 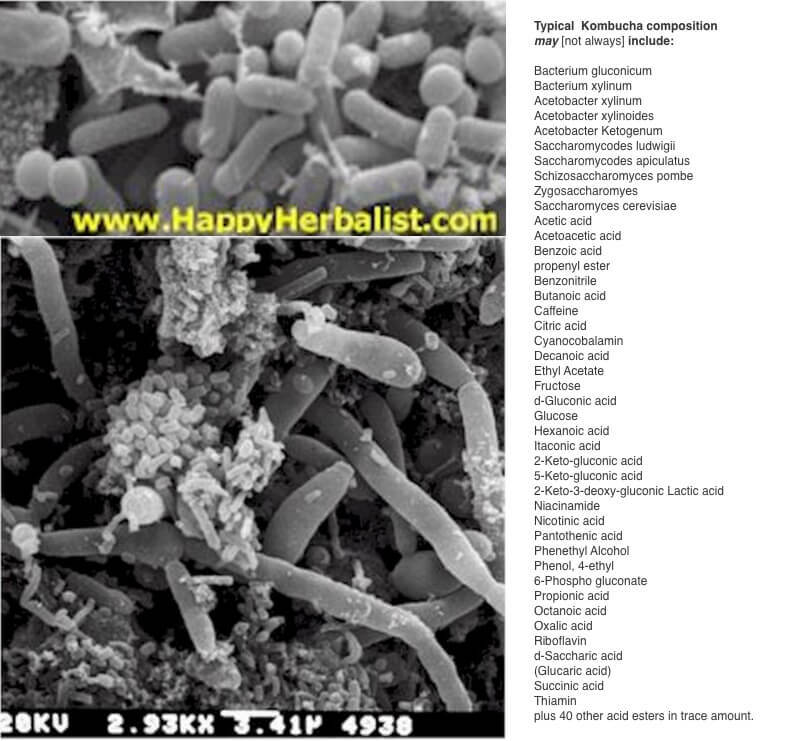 a probiotic of life's energy. pro = in favor of, biotic = life . while antibiotic; anti = against: literally means against life. Time and Temperature are two of the most important variables in any ferment. The tea, yeasts and type of sugar contributes to the taste, and are important considerations as well. The following contribute to the character of the brew. The kombucha tea will be naturally more sour the longer the ferment, or until its refridgerated. The lower the temperature (especially below 70F) the greater percentage / possibility of Lactic Acid production, less sharp, less bite. less glucronic acid. The longer time you allow the Green Tea to steep the greater the bitterness. The more tannins (tea/wood exposure) the greater the astringent quality. Specific Gravity and pH are benchmarks for the above combinations. Those are what we refer to as the "basics" . Second Stage fermenting, bottling and Chill proofing, Filtering, Clarifying, Herbs, Continuous Brewing, are additional techniques that create uniqueness in one's brew. What is Kombucha. Average Analysis of the Kombucha Mushroom Tea. NOTE: Some ferments have more, less, or none, of what we have listed here. Results Vary. Many folks consider the average 4 ounce (120 ml) of Kombucha Tea as a daily dose. Though many people drink 1-2, 12 ounce bottles on a good day. 4 oz of the typical kombucha mushroom tea may average NO Sodium, NO Protein, and 8 grams of sugar (as fructose) and 8 grams carbohydrates. You may guess-a-mate that your total sugar is reduced by 2/3 during a ferment. A small percent of sugar will remain as non-fermentable sugar no matter how long one ferments. Alcohol content depends upon length of brewing (Time) and Temperature brewed. An averages 8 days produces slightly less than 1/2 of 1% of alcohol. U.S. Law declares 1/2 of 1% or greater as an Alcoholic Beverage and is regulated. Most of the alcohol in Kombucha is produced in the first 3 days of the ferment then that alcohol begins to be converted by the acetobacter to acetic acid. A longer brew time (14 days) reduces the sugar content and alcohol content considerably although the taste moves from sweet to semi-sweet to sour to vinegar. A Second Stage Ferment, or bottling and leaving the bottles at room temperature, which increases the carbonation. This also increases the alcohol content. This second stage anaerobic ferment may increase the alcohol to 2 or 3 % alcohol. Consider beer is around 4-5%. Michael Roussin suggested an 8 day ferment at 80F (26-27C) and Cornell University Food Study indicated 9 days at 79F (26C) for the optimum blend of taste and health. Len Pozio, long time kombucha enthusiast, likes his at 14 days and 74F (23.5C). I have found it best to keep the temperature between 74 F (23.5C) and 84F (29C). The warmer temperature produces a faster more consistent ferment with a stronger more robust taste profile, while the lower temperatures produce a less harsh more mellow taste. Though lower temperatures produces more inconsistent and greater susceptibility to molds and pathogens forming. The yeasts prefer lower temperatures and may stress out at higher temperatures. The bacteria (acetobacter genus) prefer over 74F and as high as 90F. Kombucha brewing seems to work better in the summer than in the winter months. Some people make a kombucha cabinet with a light bulb or other heat source that helps maintain their perfect brewing temperatures. A live raw kombucha ferment is a true serendipitous adventure. It is never static. New acids and nutrients are constantly created and combined, into ever-changing - though predictable zymurgy. The best method to achieve the widest possible range while maintaining the fine semi-sweet elixir is the Continuous Brewing Method. The yeasts and bacteria commonly identified as Acetobacter xylinum (bacteria) and Saccharomyces yeast have been considered the key players in Kombucha Mushroom Tea ferments. However as research into kombucha continues and as recently as Feb 2007 specific strains of both bacteria and yeasts have been identified. All kombucha cultures should contain the bacteria species: Acetobacter or Gluconobacter, These bacteria are responsible for producing gluconic and acetic acid which make Kombucha uniquely kombucha. Very few Kombucha Cultures contain Lactic Acid. The Original 1927 German Patent declared "other acids, especially lactic acid was not to be found in the solution." 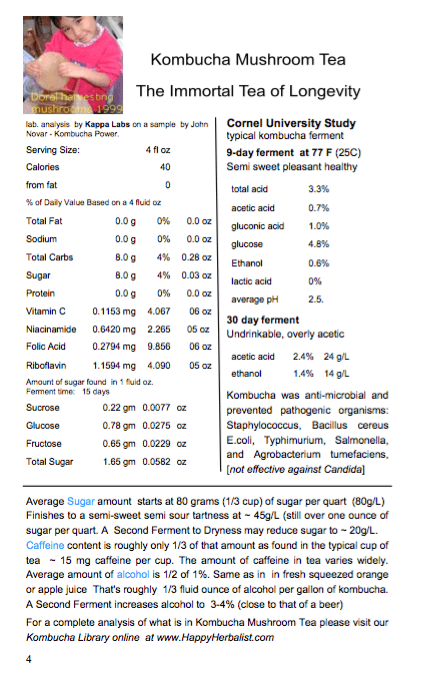 Michael Roussin's research found only a few of the over 800 kombucha cultures tested contained lactic acid. The vast majority did not. The German Patent cited "gluconic acid, acetic acid and residual sugar, which also contains tannin and caffeine" as "Kombucha". 50 yeasr later Michael Roussin's research bore out the Original 1927 German Patent testiment. Lactic acid is produced by the Lactobacillus species of bacteria. (Lactic Acid producing Bacteria). LAB, nor did Cornel University and many other modern researchers discover any lactic acidin their sturies. 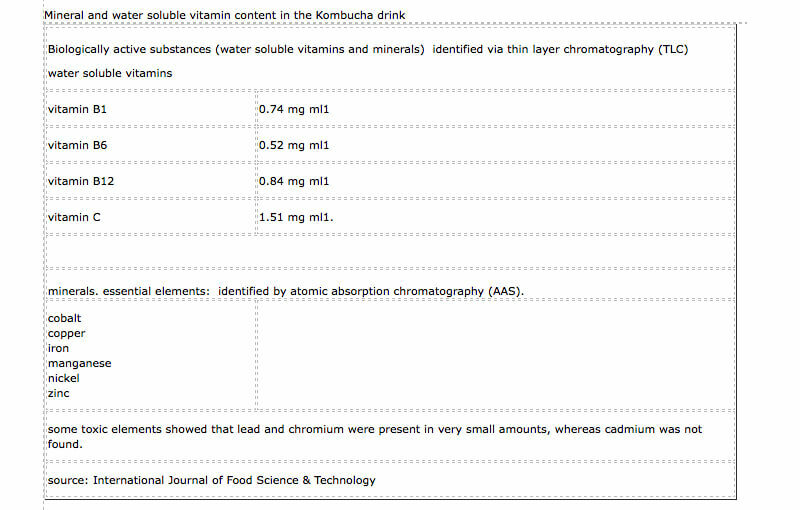 Yet many kombucha authors, continue to refer to Kombucah Tea as a Lactic Acid Ferment. A few modern "Kombucha" commercial breweries touts the lactic acid count while claiming their brew is authentic. Despite The German Patent (1927) and the extensive (800+) testing by Michael Roussin (~1995) and numerous modern day studies. The rationale may lay in the recent (2012) FDA / TTB ruling that too many commerical Kombucha Tea bottles contained too high of a alcohol level. Some as high as 4%. A quick remedy may have been found in using Lactobacillus. The heterofermentaive species of LAB produces carbonation, lactic acid and low alcohol, while the homeofermentive LAB produce only lactic acid. Forced carbonation and flavors can be added at bottling. The problem is not if Lactic Acid is in kombucha. The problem is that Gluconic Acid is not in Kombucha. Only a few species of Acetobacter (AAB, Acetic Acid producing Bacteria), such as Gluconobacter produce Gluconic Acid naturally. Lactobacillus increases the medicinal value of Kombucha Tea. Lactic acid is healthy by itself. A recent Beijing, China study found that Kombucha Tea (Acetobacter ) fermented simultaneously with Milk Kefir Grains (Lactobacillus species) greatly increases the cancer fighting ability than either fermented separated. Lactobacillus balances, and smoothes the taste. Lactic Acid is smoother and has a pleasant mouth feel as opposed to Acetic Acid (vinegar). Though this bacteria competes with both the yeast and the Gluncobacter for nutrients. Lactobacillus is the primary fermenter in vegetables, milk ferments, water ferments such as Japanese Water Crystals and Ginger Beer Plant. note: Certain species of Lactobacillus will produce some alcohol with or without oxygen. Therefore, if you want to keep your alcohol levels at the minimum avoid lactobacillus. Saccharomyces Boulardii A noted and well respected Probiotic.yeast. Boulardii Aids digestion, Increases energy. Taste similar to a slightly sour Pale Ale. Very popular with Lactobacillus which balances the taste plus adds another great Probiotic. Can produce higher alcohol levels in a short time. Torulaspora delbrueckii a slower though more complete ferment. Low alcohol, lower sugar. T.Delb is a unique yeast as it is an Aerobic Yeast - that is produces alcohol only in the presence of oxygen. Thus when bottled and the oxygen is gone T.Delbrueckii goes dormant, as does the gluconbactor. The brew stays closer to what was bottled as opposed to other yeasts which actually produce the higher levels of alcohol once the air is cut off.
. We produce our Kombucha Hybrid with organic sugar and a blend of organic black and organic green tea. Our lactobacillus is isolated from our milk kefir and improves glucronic acid production and enhances the antibacterial, antioxidant and bioactivities of kombucha. Our Hybrid creates a more complex taste and character profile. The anti-microbial activity observed in the fermented samples containing 33 g/L total acid (7 g/L acetic acid) was significant against the tested gram positive and gram negative pathogenic organisms. Candida albicans was not inhibited by Kombucha. Tea, at drinkable levels, demonstrated no anti-microbial properties. The contribution of tea itself to the anti-microbial activity of Kombucha proved to be insignificant in the tested organisms, even at the highest levels tested. As a result, the anti-microbial activity of Kombucha was from the acetic acid composition. Kombucha may be a healthful beverage in view of its anti-microbial activity against a range of pathogenic bacteria. This may promote immunity and general well being. It is recommended that Kombucha be consumed at 33 g/L total acid, 7 g/L acetic acid, to obtain these beneficial attributes. Other studies; Guttapadu Sreeramulu, Yang Zhu, and Wieger Knol although they recognized the antimicrobial effects of acetic acid suggests the presence of antimicrobial compounds other than acetic acid and large proteins in Kombucha that may be responsible for Kombucha's antimicrobial activity. Another study ruled out lactic acid, ethanol, or tannins (such as those found in tea) as contributing to Kombucha's antimicrobial activity. Besides drinking kombucha tea, the anti-inflammatory property of the kombucha mushroom (SCOBY) itself has been studied and is often used in folk medicine applied directly to cuts, burns or abrasions. Note on Candida: ferment your Kombucha Mushroom Tea as long as possible so that there is relatively little sugar remaining. Also consume it on an empty stomach as your digestion will absorb the glucose quicker than the Candida can make use of it. The nutrients needed and generally the discussion revolves around what type of tea (Camellia Sinensis./ Black, Green or Oolong. Purists hold the argument that kombucha must be brewed using only Black (Russian) tea. Others more recently opted to use green teas especially when viewed in light of cancer research and the individuals looming concerns. Another driving force has been the concern over caffeine content. Both black or green tea provide all the components for kombucha growth albeit in different amounts. The taste sensation is as typical as the difference in seeping a green or black tea. There is a notable difference in the growth of the SCOBY and the effervescing of the Kombucha. Green tea producing a thinner clearer mushroom yet with a faster growth rate and a more bubbly tea. Neither which has been identified with any specific health benefits. Black tea generally contains more purine. Günther Frank (1994) considers the purines an important contributor to kombucha mushroom tea. What happens to the actual caffeine during the fermentation cycle is another debate. Many claiming that it (as well as the sugar) are eliminated during this process. However that is very largely dependent upon several factors. The beginning caffeine level of the tea, the total amount of nutrients available for the kombucha, the time and temperature of the ferment, being just the main concerns. Total nitrogen in black tea represents 4.5% of the dry weight:[ 0.92% is found in soluble proteins, 2.51% is insoluble and 1.07% is contained in caffeine (for a tea containing 3.71% caffeine) and theophylline]. Kombucha may break down caffeine when it is otherwise starved. an analysis by David Chappuis. 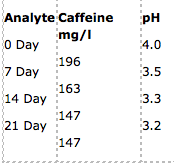 reported a reduction of caffeine by 25% during the first two weeks of fermentation. Extrapolated out higher percentages should be expected over a 30 day period but seem to level off. 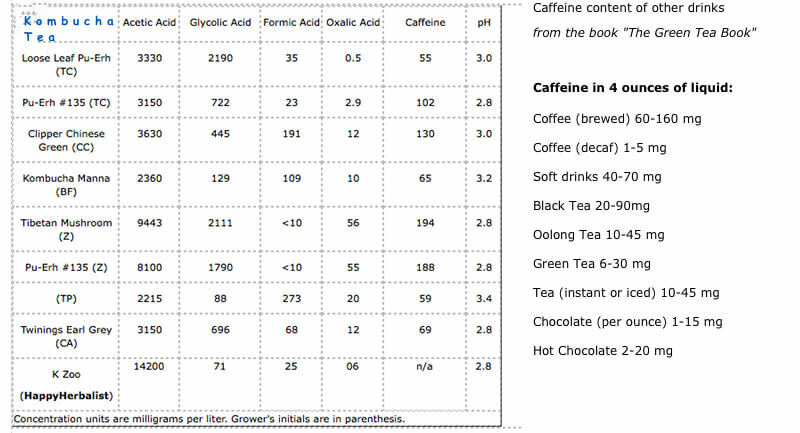 Caffeine content of other drinks from the book "The Green Tea Book"
note: that all coffee's just like all teas are not equal. Typically kombucha tea is made with 5-7 t-bags per 3 quarts of water. Therefore Kombucha Tea = about 1/3 of the typical caffeine of a cup of tea. The presence of caffeine in tea does not produce unhealthy results due to its combination with tea polyphenols.. Although many folks have told me that even decaffeinated tea in their kombucha ferment was felt and suffered adverse effects. The Kombucha bacteria are stimulated by caffeine and when one encounters a sluggish ferment and want to get it going using a higher caffeine tea (like Black Tea or a Pu-erh, or a Silver Needle White Tea will energize the kombucha. - Methinks that's why men in particular like kombucha. The kombucha bacteria are like men - who love the rush of sugar, caffiene and alcohol. - life is good. They haven't found a lot of vitamins and minerals in Kombucha Tea. There has been some speculation that the B vitamins - generally at a minimum, have a greater affect on humans because they are more bio-available. Glucuronic Acid. A lot of interest in this acid. Here is a link to Michael Roussin's research. We routinely have our mushrooms tested (San Rafael Chemical Services, Inc). Especially for three key markers. 1. Acetic acid, Gluconic acid and 2-keto-Gluconic acid - which what appears to be what most other kombucha researchers have been referring to as "Glucuronic acid". 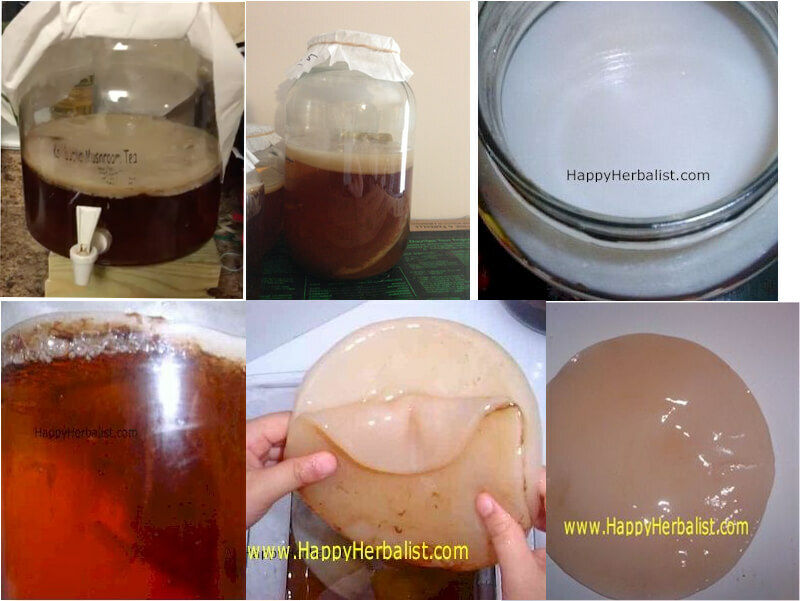 see Analysis Report of the HappyHerbalist's kombucha mushroom. While all our strains show consistent high marks we are proud that our White Kombucha has the highest marks. (for example 15.3 g/L acetic acetic, 29.6 g/L gluconic acid, and 2.37 g/L 2-keto-Gluconic acid. The higher the values the greater concentration of beneficial acids. These ratios are also critical. The higher the value of gluconic acid compared to acetic acid the smoother the taste (less sharpness). Compared to the typical kombucha ferment in the Cornel Study our White kombucha has almost twice the beneficial acids while maintaining a pleasant taste. We achieve even higher ratios, almost doubled of our White Kombucha with our Concentrated Kombucha Tea Extract (example 35.4 g/L acetic acetic, 53.0 g/L gluconic acid, and 2.97 g/L 2-keto-Gluconic acid). Our Concentrated Kombucha Tea Extract has about 25 times that of the typical kombucha brewed tea. However, there is a stronger vinegar taste although still some sweetness to it. Concentrated Kombucha Tea Extract does not contain live probiotics (bacteria and yeasts) as does the fresh brewed kombucha tea, nor does it contain or need any chemical preservatives. Kombucha Mushroom Tea is really great. With a little effort you can make it taste just as you like it and unlike other elixirs you can direct its health benefits to your specific concerns. Really Amazing for something that cost so little and so easy to make. see Kombucha Cautions and Safe Brewing tips. I would like to conclude this article (more in our Library) that Kombucha Mushroom Tea is SAFE and HEALTHY. But over the years and against the protest of other Kombucha (over) enthusiasts I believe Kombucha Tea may not be for absolutely everyone. Certainly not for babies and children under the age of 4. Nor for Nursing mothers, or should be used with caution in those that are immune compromised or other states. And at times not for those on blood thinners. Yet, in many cases kombucha has helped all those. My caution is that it simply not for everyone and be considerate. A physician's number one duty is to do no harm. Quite a few folks have complained that Kombucha Tea made them a bit dizzy. A little like a hang-over. A few have told me that they had to sit down, that they were so dizzy. So I continue to research this effect. It certainly only adversely affects so very few. I have been considering Acetaldehyde. A great deal depends upon the state of health and development of the mother and baby, or child. Blood glucose levels, hydration level, vitamin and mineral deficiencies especially vitamin B-12, all affect the body’s responses to acetaldehyde. Acetaldehyde is a reactive chemical that, at high concentrations, can cause sweating, rapid pulse, skin flushing, nausea, vomiting, and dehydration. These are typical of a hangover and many kombucha drinkers do experience a slight buzz as if they had had a drink or two - and may go towards fatigue and the feeling that one needs to sit down. Adverse reactions like these may happen due to other causes like mold or sensitivity to wayward bacteria or yeasts that came along. Each brew of Kombucha, Jun, Ginger Beer, etc may be different and if one particular brew seems to you to be a little off - then brew another batch. A great benefit of all these brews is that they are cheap and easy and generally very safe to make. as always we are interested in your comments. Gluconacetobacter kombuchae sp. nov., isolated from Kombucha tea. Yeast ecology of Kombucha fermentation. The yeast spectrum of the 'tea fungus Kombucha'.